The Tottenham Hotspur Football Club (3rd place, 60 points) is apparently back in the Premier League title fight with Liverpool and Manchester City. 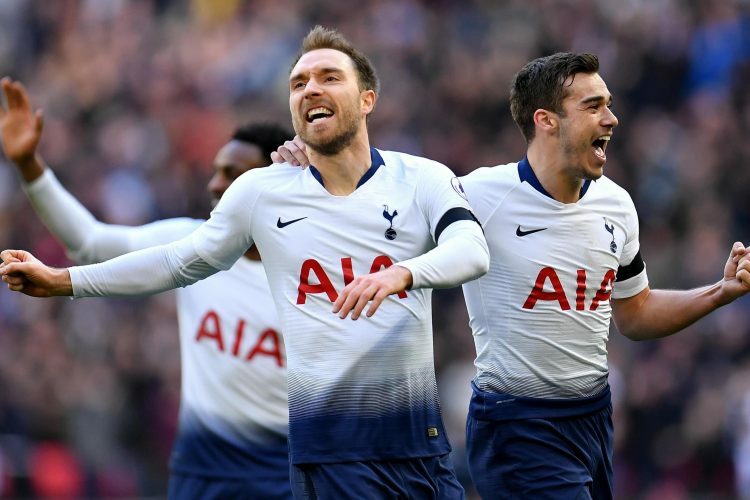 Should the Spurs win the match on Saturday afternoon away in Burnley (15th, 27 points) and lose Liverpool in Manchester the following day, the Spurs would have the chance to clinch their first English championship since 1961. Tottenham would have to win all remaining games, including the direct duels with Liverpool (32nd matchday) and Manchester City (35th matchday). This will not be easy and realistic such a series may not appear, especially since already next Wednesday with Chelsea and the weekend after with Arsenal, two extremely difficult games are waiting for the Spurs. One big advantage, however, is that Tottenham has a break of three weeks in March, while Man City (four games) and Liverpool (three games) have to do during this period. In Burnley, Tottenham are favorites to win, according to our prediction. This underpinned at Burnley vsTottenham also all odds of bookmakers for betting on the Spurs. However, it will not be easy at 13:30 against the Clarets. Burnley scored the fourth-highest points in the calendar year of 2019 (twelve points) and even one point more than Liverpool. In addition, Burnley is next to Manchester United, the only team in 2019 in the league still without defeat. With just three wins from the first 19 Premier League games this season, the Damocles sword of relegation hovered menacingly above the heads of Burnley players and coach Sean Dyche. Since then, however, the Clarets remained undefeated seven consecutive Premier League games (4-3-0). Only Manchester United is with nine matches currently even longer without defeat. Burnley himself last time between May and September 1966 completed a long series of unbeaten Premier League games (then there were nine games). Still, Burnley is against Tottenham, according to odds only outsiders on Saturday. The Spurs are the league’s best away team and that’s why between Burnley and Tottenham our prediction is an away win by Pochettino and Co. The turnaround managed coach Sean Dyche, in which he put on the tried and tested. “Ginger-Mourinho” put Tom Heaton back in the goal and bet on the 4-4-2 system that has been successful in recent years, leading Burnley into the Europa League qualification last season. Taking on all the goalkeepers who have played at least five games in this Premier League season, Burnley’s goalkeeper Heaton comes on 80 percent parried shots (Premier League best). Striker Ashley Barnes has scored in each of his last three Premier League games and is something of the league’s most underrated player. He also converted a penalty in his last two games. Only five players have ever scored in the Premier League in three consecutive Premier League games a penalty. The last one was called Sergio Agüero. However, Burnley’s record against the established top six teams remains expandable. Since defeating Liverpool in August 2016, the Clarets have only scored two out of a possible 42 home points against the top teams (0-2-12). Burnley did not concede in any of these 14 games. The Clarets conceded 27 goals and scored only six times. Accordingly, between Burnley and Tottenham a tip on a success of the Spurs is worth considering. Aaron Lennon, Jonathan Walters and Steven Defour are all injured. Matthew Lowton could join the team for Phil Bardsley as right-back. Significantly earlier than expected, star striker Harry Kane reports, after his injury suffered on Jan. 13, to resume operations. For his coach Mauricio Pochettino, Kane is like an “animal” just waiting to be unleashed. No good sign for Burnley vs Tottenham, where, according to odds of the bookmakers, the Spurs would have generally gone as a favorite in the game. Tottenham have already won eleven away games in this Premier League season, most in the Premier League era. Tottenham drove more away wins only in the 1984/85 season, when the Lilywhites won 12 times in the stranger. Only Liverpool (once) was less often without own hit in this Premier League season than the Spurs. Tottenham did not beat the two Manchester clubs alone: ​​1-0 against City in October and 1-0 against Man United in January. Tottenham scored 12 goals this season from outside the box. This corresponds to the current top value in the English Beletage. Since it is a good thing that Burnley conceded most of the goals from outside the area (12 goals conceded). Also, one reason why between Burnley and Tottenham recommends our prediction, a tip on away win Tottenham. One of Spurs’ absolute top players this season is South Korean Heung-min Son, who scored eight goals for the Spurs in his past eight Premier League appearances. Last nights son hit three times in a row. Son was able to score four league games in a row in April 2017. Kane has scored 20 competitive goals this season (six assists), but is expected to take his place on the bench on Saturday. With Ben Davies, another injured returned this week. Also back are Eric Dier and Danny Rose. Only Dele Alli and Vincent Janssen are still missing. Burnley did not win any of the past seven Premier League powers against Tottenham (0-2-5). The last Burnley victory against the Spurs was on the final day of the 2009/10 season with 4: 2. Tottenham did not concede at any of Turf Moor’s last three appearances against Burnley. Two games of it were won, once the pair ended with a draw. According to the bookmaker, Burnley is outsider to Tottenham. This is clearly shown by the odds. Tottenham is currently the best away team in the league and wants to stay in the championship race with a win. Burnley has not lost since seven Premier League games and is in the calendar year 2019 the team with the fourth-most points, but Burnley has not been able to win since August 2016 at home against a top six team. Only two points out of a possible 42 have since jumped out in Turf Moor. The Spurs have never conceded in their latest three appearances in East Lancashire. Thus, our recommendation goes in the direction of an away win for the Spurs. If you follow this advice, you’ve got Burnley vs Tottenham with a hint the odds on odds of 1.74.